YATLOML | What Does YATLOML Mean? 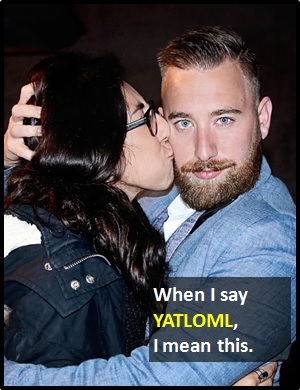 YATLOML means "You Are the Love of My Life". The abbreviation YATLOML is used to mean that the recipient is the greatest love of the sender's life. A similar phrase is LOML ("Love Of My Life"), which can be used to refer to a person, a thing or pastime (e.g., a car, horse, motorbike or sport). YATLOML means there is no one for me, but you. Phil: I'm so happy we met. Nadia: Thanks, but I thought that was motorbikes. YATLOML can be used as a standalone declarative sentence (i.e., a statement). In other words, it is not necessarily used as another part of speech within a wider sentence.